"This is a tasty butter cookie, rolled in nuts, filled with caramel, and coated with chocolate. I won a local baking contest with these. Everyone loves them! You can fill the cookies with caramel apple dip instead of caramel ice cream topping. Works great!" In a medium bowl, cream together the butter and sugar until smooth. Stir in the vanilla, then the flour. Roll the dough into walnut sized balls, roll the balls in the egg whites, then roll them in the chopped pecans. Place the cookies 1 1/2 inches apart on an unprepared cookie sheet. Using your finger, make an indention in the center of each cookie. Bake for 12 to 15 minutes in the preheated oven, until bottom of cookies are lightly browned. When the cookies come out of the oven fill the indentation with the caramel filling, and let cool. 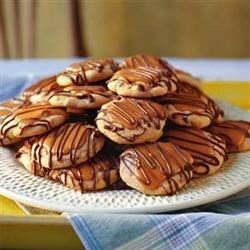 Pour about 1 to 1 1/2 teaspoons of chocolate over each cookie to cover the caramel center. Let stand until chocolate is set. These fun chocolate-frosted cookies look just like turtles! I made this for my mom and dad and they looooved them.They were really good.